Young Henrys is a Sydney-based brewery, and I’m an Auckland-based craft beer blogger. Yet I drank this bottle of Newtowner pale ale in Mooloolaba on Australia’s Sunshine Coast. It was another warm, sunny day – perfect beer-drinking weather. 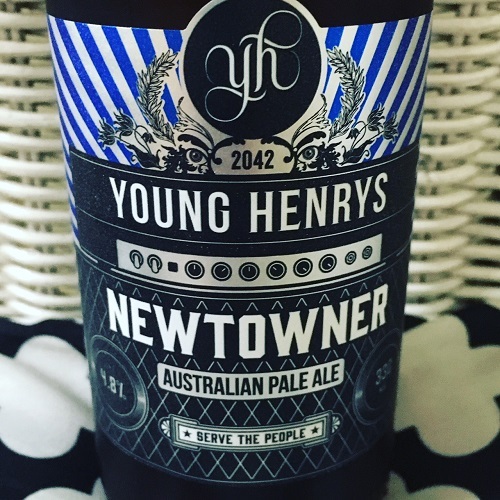 Blurb on the box: Young Henrys Newtowner is a refreshing pale ale with great balance and hoppy aroma. Blended using Australian malts and three varieties of local hops, this ale showcases the unique style of the Sydney suburb of Newtown. The review: It irks me that the name of this brewery – Young Henrys – doesn’t have an apostrophe in it. I mean, is this beer made only for young people called Henry? Or is it made by young people called Henry? I’m so confused! Fortunately, this Newtowner pale ale somehow manages to quell my grammar-Nazi sensibilities. It smacks of smooth caramel and butterscotch, some citrus (though not as much as you tend to get in New Zealand pale ales) and malt biscuit. I drank it straight from the bottle, so I can’t comment on its colour. But I can tell you that it was light bodied with only medium carbonation. The verdict: Young Henrys’ Newtowner pale ale isn’t anything to write home about, but it’s okay. You could certainly do far worse than drink this beer on a sunny afternoon at the beach. Beer/movie combination: Like this beer, Ocean’s 8, the latest film in the Ocean’s film series isn’t remarkable, but it’s pretty good. The cast is fantastic, but the story is lacking, and the tenuous links to the other films in the series are a bit jarring.